On July 7, 2018, at the courtyard of the Intercession Women's Monastery in Markovo, solemnly celebrated the patronal feast in honor of the Nativity of the honorable glorious Prophet, Forerunner and Baptist of the Lord John. This saint is dedicated to the right side chapel of the church. The Divine Liturgy was led by the cleric of the monastery, Priest John. During the service prayed the abbess of the Intercession Monastery Feofaniya Abbess, the monastery residents and parishioners of the monastery. The choir of the monastery of the Intercession Monastery sang. 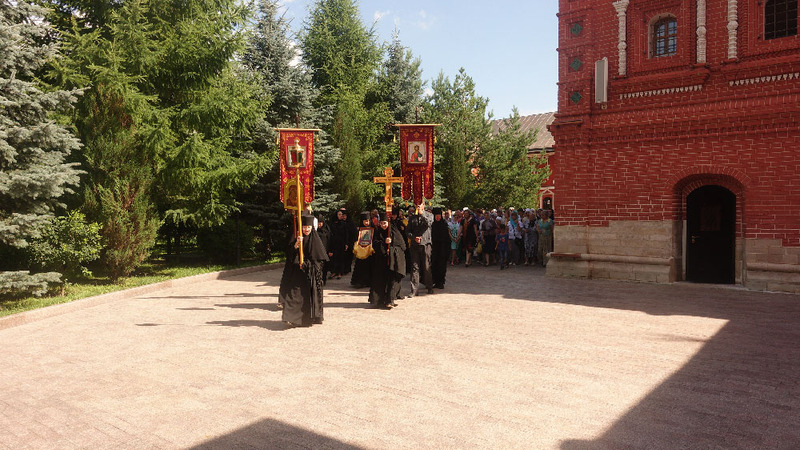 At the end of the liturgy on the occasion of the patronal feast, a water-moleben was celebrated and a procession around the temple was performed. At the end of the celebrations, monastic baked goods and tea were offered to all parishioners to reinforce the bodily forces. And the smallest pilgrims then happily frolic on the playground. July 20, 2018, All-night vigil with the reading of the akathist at the feast of the icon of the Virgin Mary in the city of Kazan (1579) at the courtyard of the Pokrovsky Stauropegial Convent in the Church of the Kazan Icon of the Mother of God in the village of Markovo. On 11 and 12 July 2018, the All-Night Vigil and the Divine Liturgy were performed on the feast day "Feast of the Saints of St. Peter and St. Paul" in the Intercession Church of the monastery. Divine services were led by cleric of the monastery. July 9, 2018 in Pokrovsky Women's Monastery solemnly celebrated the feast day in honor of the Tikhvin Icon of the Mother of God. The throne is in the left side-chapel of the Church of the Resurrection of the Speaker. On July 7 and 8, 2018, on the day of the patronal feast, the All-Night Vigil and the Divine Liturgy were performed in the church of the holy pious princes Peter and Fevronia of Murom, which was performed by the cleric of the monastery, Archpriest Ilia (Osievsky). On July 7, 2018, at the farmstead of the Intercession Women's Monastery in Markovo, solemnly celebrated the patronal feast in honor of the Nativity of the honorable glorious Prophet, Forerunner and Baptist of the Lord John. This sacred is dedicated to the right side chapel of the church. Birthday of Abbess Theophania On July 2, 2018, the day of the memory of the holy apostle Judas, the brother of the Lord according to the flesh and prelate of Job, the Metropolitan of Moscow in the Pokrovsky Stauropegial Convent, celebrated the birthday of his prioress Abbess Theophania (Miskina).